Spring stands at the Water-Poet's door in a top hat and tails. 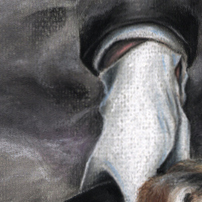 He raises a white-gloved hand—the one not holding a white cane—to tip his hat. He asks the Water-Poet to write him a fog sestina, a dozen sudden downpours, and forty-three cool showers for tomorrow. "Absolutely," says the Water-Poet. He puts precipitation to paper over a repast of pastrami on pumpernickel, and presents the product to Spring the proximate morning. Spring reads fog so thick it muffles sirens and confounds compasses. "Lovely," he says from somewhere in the gray mist beyond the threshold. "Your payment." 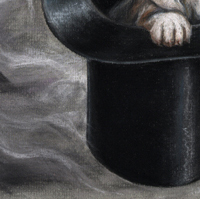 He thrusts his top hat out of the fog and pulls out a lumpish, blinking puppy. The puppy is white with black and brown spots. She has long, floppy ears and a pink tongue. The Water-Poet tries to think of a name. Spot? Floppy? Pinky? He decides on Delta, and once the fog has cleared he takes her for a walk. Sort of. Delta walks two blocks and then sits, exhausted. 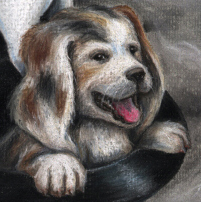 The Water-Poet carries the puppy to a park and sits with her under an old oak tree. A sudden downpour sends a young woman running for shelter beneath the tree, and she smiles at the puppy and the Water-Poet. "He's cute," says the young woman. "What's his name?" "It's a she, actually," says the Water-Poet. "Her name is Delta." "That's nice," says the young woman, "but I was actually talking to the dog." By the time Summer, in her bathing cap and swim dress, knocks on the Water-Poet's door, the young woman (whose name turns out to be Hilda) is his wife, and she and Delta are both expecting. Summer has a list inside a waterproof sleeve. "Three dozen thunderstorms, eleven with tornadoes. Sixteen sun-shower sonnets. Hail the size of robin eggs." The Water-Poet nods. "What about a freak snowstorm?" he asks. "Not this year," says Summer. Summer looks thoughtful. "OK. Make it two." Summer pulls her list out of its sleeve and adds, "Wtrspt.—2" at the bottom. Then she replaces the list, seals the sleeve and wishes the Water-Poet a good day. "And to you," says the Water-Poet. He molds meters marrying moist melodies to meditations on middle age. The waterspouts flow easily from his pen, and the hail is cathartic, but the thunderstorms are dreary and interminable. When he hands the package over to Summer the next morning he knows it's not his best work. Summer doesn't seem to notice. She puts up a parasol and reads a sonnet. "Lovely," she says. She hands him an acorn in a plastic bag, and a waterproof sleeve with documentation for the IRS. "Nice doing business with you," she says. The Water-Poet plants the acorn in his front yard, with a stake beside it so he won't mow it down when he does the lawn. An oak tree sprouts and survives the hail and the three-week drought between a flirtatious sun shower and a cluster of severe storms. By the time Autumn drops by, it is forty feet high and shedding gold leaves. "I need some cold drizzle," Autumn says as children and puppies run through the doorway past him—out to climb the oak tree, out to go trick-or-treating, out to college. Autumn has a receding hairline and patches on the elbows of his corduroy blazer. He smells like roasted pumpkin seeds. "Some cold drizzle," he repeats, "a rainy-day epic, six or eight dustings and one late-season blizzard." "Can we skip the blizzard?" asks the Water-Poet. "No one appreciates blizzards this time of year." "Blizzards are cool!" says his eight-year-old son, on his way out to collect his BS in Meteorological Science. Autumn spreads his hands. "I need a blizzard." Delta steps outside and lies down on the porch. Her coat is almost entirely gray, and she barely lifts her head to acknowledge the succession of her children, grandchildren, and great-grandchildren that trot up to sniff hello. "Do you need an Indian summer?" the Water-Poet asks. "I could do that." "You're a Water-Poet," Autumn says. The Water-Poet throws up his hands. "I need an extra day, then," he says, and he does. In despair he dreams dull, dripping skies defying description. But the next day during their weddings the children bury Delta in leaves until she shrugs herself free and chases them around the yard. The Water-Poet runs with them until his ears hurt, and then he sits on the porch massaging Hilda's feet and composing weather in his head. "Excellent," Autumn says the next morning, as drizzle darkens the shoulders of his blazer. "Your work shows a real maturity." The Water-Poet doesn't want to hear that. He longs for the brashness of his early work. Autumn opens his blazer, and a host of sparrows emerges, flapping their wings and chirping. They settle in a row amid the golden oak leaves and perform selections from The Nutcracker . Hilda and the Water-Poet and their children and Delta and her clan all gather to listen, and when the concert is finished they applaud or howl according to their capabilities. The sparrows bow repeatedly until, at some unknown signal, they ascend simultaneously from their perches and wing their way south. The children kiss their parents and leave with Delta's descendants for cities far away. Hilda and the Water-Poet are left in the big empty house with Delta and the oak tree and a single sparrow, which stays behind and builds a nest in the fruit bowl. By the time Winter comes around Hilda has passed on, and Delta too. The children are married, in love, or happy, and the Water-Poet lives alone with the sparrow and Alpha, son of Omega, one of Delta's great-great-great-grandchildren. Winter is a pale woman in a fur coat made from an animal that has never heard of Thinsulate. She wears a puffy fur hat and her hands rest in a fur muff. She tells the Water-Poet that she needs sixty-seven flurries, eight Alberta clippers and a collection of slushy haiku. "I don't do that anymore," says the Water-Poet. "Not since Hilda died." "You were contracted for a full year," says Winter. "I can ask the attorneys to explain it to you, if you like." The Water-Poet is too old to deal with lawyers. "Can I have more time?" he asks. He doesn't need it. 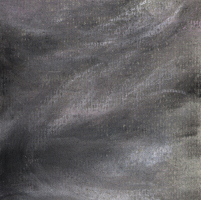 A frenzy of frigidity flows from his fountain pen, framing a life in frost. His lyrics are stark and hopeless and exquisite, bitter and cold and beautiful. Almost, when Winter reads seventeen syllables of traffic-snarling sleet, it seems that her porcelain features will melt and weep. But of course they don't. "You are a master," she says. She reaches into her coat and pulls out a hardcover book bound with embossed leather. "Your payment." It is a collection of his water-poems. Once Winter has gone, he sticks it into a pocket of his winter coat and trudges through the wet snow piling up on his front lawn. Alpha follows him to the oak, and the sparrow as well. The sparrow flies up into the high branches and sings a song the Water-Poet cannot put a name to. He begins to climb. It is difficult at first; he is not as strong as he once was. Alpha is reluctant to follow, and whines at the bottom. The Water-Poet rests after he has climbed fifteen feet or so, and calls to the dog in a gentle voice. "Come on, boy. It's not so bad." When he stops for another rest at the half-mile mark, Alpha comes running up the trunk and offers his head for scratching. The Water-Poet makes soothing sounds, and the dog bounds away to chase butterflies among the branches and the drifting snow. The voice of the sparrow drifts down from far above, and the Water-Poet resumes climbing. He climbs through the clouds and sits down in a crotch of the tree. Alpha settles himself at his feet, and the sparrow alights on his shoulder. The Water-Poet takes out the book of his poems and begins to read aloud. The early poems are ones he has all but forgotten, and they are equal parts pretension and raw emotion. Below him strands of cirrus and stratus swell and spread to cover the earth. He reads on through the works of his middle youth while Alpha dozes and the sparrow provides countermelodies to the cadence of encroaching inundation. Lightning flashes illuminate cumulonimbus from below; wall clouds pile up and begin to spin. Alpha dreams of a land where he runs with his brothers and sisters and never runs out of breath. Squirrels and other things tease his nostrils with their scents, often near but always just out of reach. When he rolls over, hands scratch his belly and voices speak in soothing tones. The Water-Poet is too tired to weep, too jaded to be moved by his own poems, but the clouds shed tears for him. They pour themselves out over the world and swell the lakes and streams. Coastlines contract and riverfronts sink beneath the inexhaustible reservoir of sadness in the Water-Poet's heart. Alpha's dream germinates upon a branch of the oak and swells like a butterfly's cocoon. Inside it lives a young Water-Poet, one whose pain is not large enough to drown the world. The sparrow, overcome with despair, flies into the dream and becomes a multitude of birds which dwell in trees and corduroy blazers and other places hidden to Alpha and his kin. Alpha's dream grows while the world below shrinks under the Water-Poet's works. Cities blink out from beneath the darkness and inflate the cocoon with parks and fire hydrants and veterinarians with gentle hands. 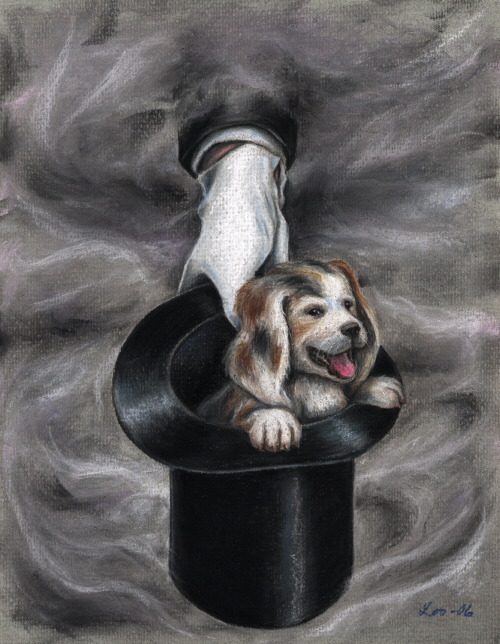 Alpha dreams a man in a top hat and tails who pulls off a white glove and pats him on the head. "Good dog," he says. The dream becomes a globe with the unhappy man and the sleeping dog at its core; beyond it, the drowned world becomes a reservoir, closed off behind a stone firmament. The Water-Poet reads the last poem in his collection. His throat is dry, and he shrivels and folds in on himself until he shrinks down to an acorn. Summer plucks him up and seals him in a plastic bag. Alpha sleeps in darkness until a pale hand strikes a match and lights a fire in a cozy fireplace. Winter takes off her heavy coat, picks up the collection of the Water-Poet's works, and sets it on a shelf next to a thousand similar volumes. Then she pulls a ragged paperback romance from her coat pocket, pets Alpha as he sleeps, and settles down in a leather recliner to wait for her turn to come around again. Ann-Cathrine Loo studied art in Sweden, then got an B.A. in Anthropology and two children in between drawing portraits and making murals for local hospitals. She moved to England because there are more castles there. When not doing Viking reenactment or fighting the garden, she illustrates books and stories. You can see more of her work on her website, and you can contact her at ann-cathrine.loo@cunobaros.com.